Derrick Kosinski & Scott Yager are joined by Melinda Collins. Melinda Collins (@MelindaStolpMTV) returns to the show, this time for a special BONUS PODCAST that was initially exclusive to Patrons over at www.Patreon.com/ChallengeMania, where she joined Derrick (@DerrickMTV) and Scott (@SHOTOFYAGER) for one of our "Reckoning Reviews". The podcast was so good and so long, Melinda was so great, and this episode of The Final Reckoning has remained such a hot topic that we have ... See More chosen to do something we never do...share our exclusive Patron-only content with the masses. 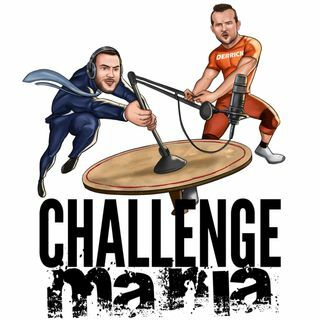 Hopefully this will encourage you to consider becoming a Challenge Mania Patron. This is what our bonus podcasts are like over there. Instead of long-form interviews where our guest is the main subject, during these Reckoning Reviews, we break down the week's episode and take questions about or based on that episode. Sometimes it is just Scott & Derrick. Sometimes we have a guest like Melinda. Sometimes we bring on one of YOU for our Meet the Patrons podcast series! On this podcast, we dive head first into the crazy episode of The Challenge where Cory and Tony get into it physically and Devin and Johnny get into it verbally. Please note that this podcast was taped before we had Tony on to clarify a few things. If you haven't heard that episode yet, that's fine. Listen to this one first actually, then that one. We taped this one on Wednesday, October 24th, the day after that episode aired. This one is loaded with opinions and it even gets pretty amped up a few times. This episode of The Final Reckoning hit us just as hard as it hit most of you guys. We then spoke to Tony a few days later and it actually does look now like we're going to be having Devin on to add another perspective to this whole ordeal. Stay tuned for that later this week. Be sure to check out Melinda's podcast, The 8th Sin, available wherever you get your podcasts! POSHMARK is giving Challenge Maniacs $5 off their first order! Download their app and start shopping. Use the code CHALLENGEMANIA for the discount. We are doing a Challenge-themed Halloween Costume Contest, this Wednesday, 10/31! Dress up in your best Challenge-themed costume and you could win a Challenge Mania Swag Pack!